Flannery O'Connor's A Good Man is Hard to Find essays examine O’Connor's most famous story that appeared in Modern Writing I. 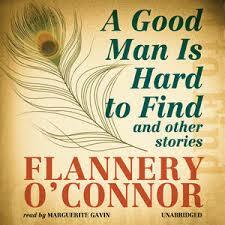 Author Flannery O’Connor wrote her most famous story “A Good Man is Hard to Find” in 1953. It first appeared in an anthology, Modern Writing I, but has been reprinted in a number of places since, marking it among the most well known of her work. The story details a road trip. Bailey wants to take his family to Florida, but his mother (the grandmother) objects, wanting to see Tennessee instead. She has read newspaper accounts that an escaped convict known as The Misfit is headed towards Florida. Still, the grandmother is the first one in the car the next morning as the family heads towards Florida, and their doom. Paper Masters can compose a custom written research paper on Flannery O’Connor that follows your guidelines. The grandmother’s interactions with the owner of a restaurant reveal a desire for a return to the past, when people were nicer. This desire is clearly reflected in the poor behavior of her own children. At the grandmother’s urging, the family takes a side detour towards an old plantation house, but wind up wrecking the car. The first passing car just happens to be The Misfit and his men, and despite the grandmother’s appeals and appeals to the idea that he is a good man, The Misfit shoots the entire family. The idea of religious salvation is found in the moment just before the grandmother dies, as she tries to reach out and claim him as her own. A Good Man is Hard to Find Analysis book reports examine the story of a family road trip gone horribly awry. A Good Man is Hard to Find Symbolism book reports examine the overtly religious and mundane symbolism in this Southern Gothic Tale. Order a research paper on symbolism from paper Masters. Setting essays discuss the literary element that helps define a short story or novel . Paper Masters writes custom research papers on Flannery O'Connor's A Good Man is Hard to Find and examine O’Connor's most famous story that appeared in Modern Writing I.